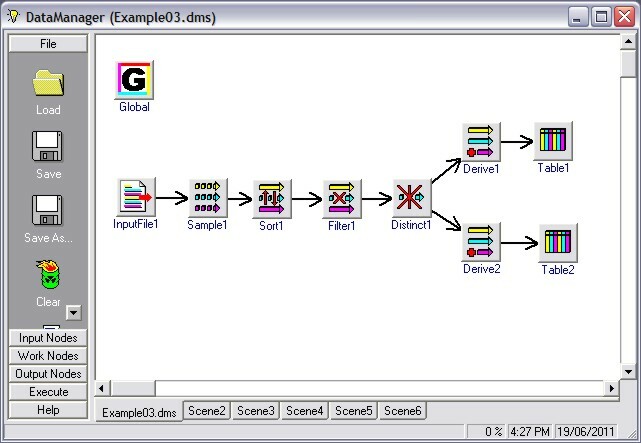 is a program which allows you to process and manipulate your data in a easy and logical manner using a graphical interface. 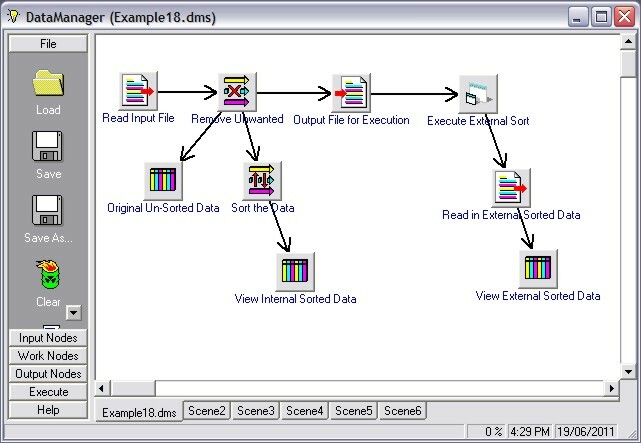 DataManager reads and writes deliminated files such as comma seperated files (CSV) and also can read data from ODBC Data Sources. It allows you to construct a conceptial design on how you are going to process your data and transform it into another form. You form your design by adding functional nodes and linking them such that the links form the data flow through nodes on a graphical work area. Global - This node allows you to specify global constants which can be used in various nodes of the current scene. You can also specify a global constant file which can be used to read the constants from a file. InputANYDB - This node allows you to read data from ANY Data Source where you specify the connection string required for ActiveX ADO connections. It also allows you to set parameters on how to read in the data. InputFile - This node allows you to read in a data file, it also allows you to set parameters on how to read in the file. InputODBC - This node allows you to read data from a ODBC Data Source, it also allows you to set parameters on how to read in the data. Append - This node allows you to append two input streams into one output stream. The first input stream is outputed followed by input stream 2. 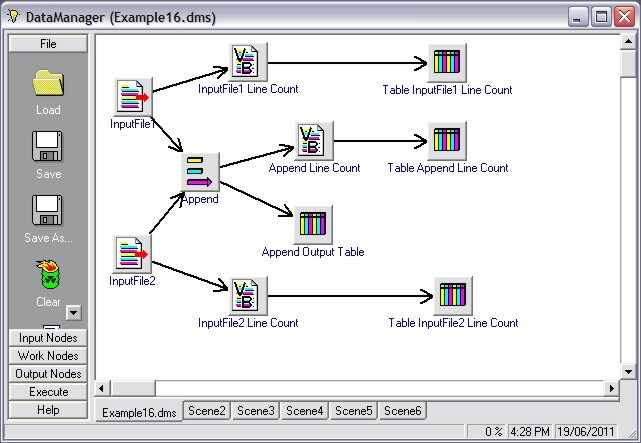 Derive - This node allows you to derive new output column data. You can perform simple mathematical expressions based on the input columns data. 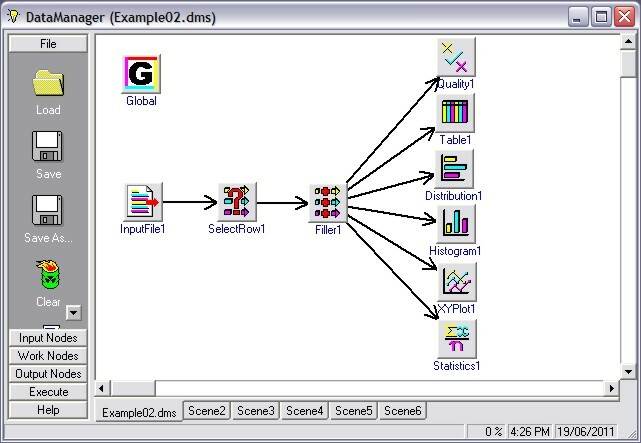 The resulting data is processed on a row-per-row basis. Distinct - This node allows you to filter out rows that have common data values for the chosen columns. The output data from this node will contain distinct rows. ExecCmd - This node allows you to run external applications after a OutputFile node has executed. It can be used to run an external application to further process the output data file or just trigger another application. 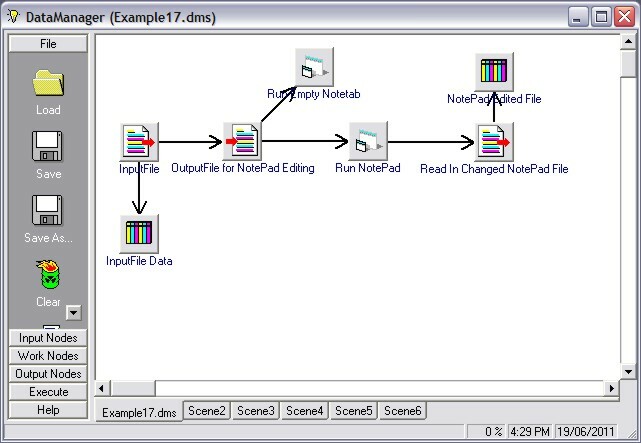 Filler - This node allows you to fill in missing data contained in the input data. You replace the ? value with a supplied value or on the Min,Max or Average value of valid data in the specified columns. Filter - This node allows you to filter the input data and pass the remaining data to the output. The filtering is based on selecting which columns you wish to pass to the output. 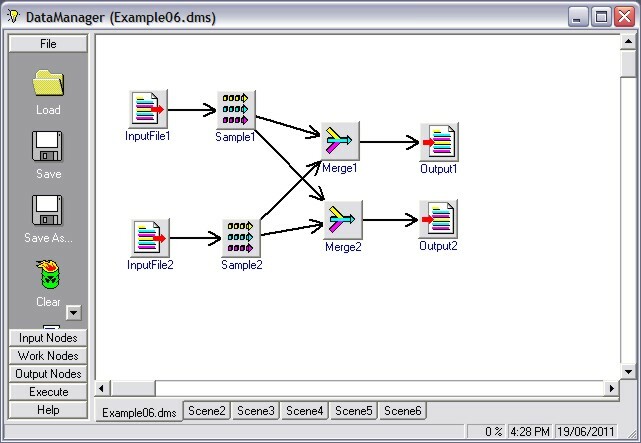 Merge - This node allows you to merge two input data streams into one output data stream. The merge is performed on a row-per-row basis or by a key merge performing a left-outer-join. Sample - This node allows you to sample the input rows and pass them out to the output. You have several options on how the sampling is performed. SelectRow - This node allows you to select which rows of data you wish to pass through to the output. This is done by setting up logical expressions based on what the data values in given columns are. Sort - This node allows you to sort the input data (row wise) based on selecting a input column. VBScript - This node allows you to process data by creating your own Visual Basic Script code. The Visual Basic Script code is executed for every row inputed into the node. You can specify new output data by defining your own columns. Distribution - This node displays a distribution plot of the discrete data values contained within the chosen discrete column. Histogram - This node displays a histogram plot of the continuous data values contained within the chosen continuous column. OutputANYDB - This node allows you to write data into ANY Data Source where you specify the connection string required for ActiveX ADO connections. It also allows you to set parameters on how to write out the data. OutputFile - This node allows you to write out a data file, it also allows you to set parameters on how to write out the file. OutputODBC - This node allows you to write data into a ODBC Data Source, it also allows you to set parameters on how to write out the data. Quality - This node displays the Quality of the data present for the columns been inputed to this node. Statistics - This node displays Statistics of the data present for the columns been inputed to this node. Table - This node displays a Table showing the data present for the columns been inputed to this node. XYPlot - This node displays a XY Plot of the chosen continuous columns.